We’re constantly improving our work, based on new trends and feedback from clients. 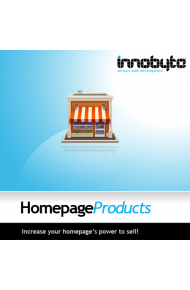 We’ve developed even further our Magento extension “Homepage Products”, one of our best-selling extensions. The new extension works on the newly launched Magento CE 1.8.0.0 and comes with the several new additional features. As we know that promotions are important to you and to your customers, we have extended the list of categories that can be shown on your Homepage with discount products. With this new version, you can also show your visitors, right from your homepage, which are your most popular products (most visited). You can also create a list of your most visited products and publish it on your homepage. You can also set the number of showed products (will 3 or 6 fit better your landing page? ), for “Tab” display mode.